- Gas supported emulsion twin-shockabsorbers. 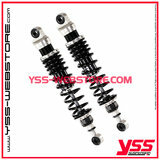 The RZ362 Topline shocks are suitable for 95% of all twinshock motorcycles above 200CC. The standard RZ362 is delivered with parts of anodised aluminium or in some cases there's a black edition, and always have black springs. We supply every length in a black edition where all aluminium parts are black anodised, with black springs. - Rebound adjustment (R) this rebound adjuster also influences the compression adjustment. - Top mounting EYE, bottom mounting EYE > available in lengths 270-500MM. - Top mounting EYE 16MM, bottom mounting clevis/fork Honda 20mm x 10/M10 > available in lengths 270-500MM. - Top mounting EYE, bottom mounting clevis/fork Suzuki 22mm x 10/M10 > available in lengths 270-500MM. For Germany and Switserland, countries where ABE is obligated we deliver a wide range of RZ362's with this model-specific ABE certification. - RZ362 Topline aluminum or black from applicationlist model-specific: € 422.- including VAT. - RZ362 Topline aluminium modular built 270-420MM: € 422.- including VAT. - RZ362 Topline aluminum custom built 430-500MM: € 502.- including VAT. - RZ362 Topline black edition modular built 270-420MM: € 472.- including VAT. - RZ362 Topline black edition custom built 430-500MM: € 547.- including VAT. 1 competitor to the RZ362's are the Hyperpro 3D twinshocks > the YSS RZ362's have more parts of todays knowledge and material use, they have more durablity with higher temperatures and with a price of € 845.- (!!) the Hyperpro's are twice as expensive!!! Price quality rate: YSS beats the Hyperpro's easily. Another competitor with the same kind of shocks are Wilbers suspension 630TS twin shocks. They are, just like the Hyperpro's, not really modern compared to the YSS RZ362 Topline and with a stunning price of € 915.- per set they are more than twice as expensive as the YSS RZ362's. 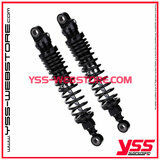 Price quality range the YSS shocks will easlily beat the Wilbers shocks.